We are creating an extended maintenance plan for our existing version1 of the product. This container ecosystem continues to be fast moving. Our customers have been key to our innovation, helping us co-create the key functionality and the overall product. The purpose of extended maintenance is to add predictability as customers plan their rollouts. Version 1.7 of PX-Enterprise will be an extended maintenance release for one year starting today (November 21, 2018). 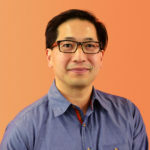 All older versions should upgrade to v1.7 or subsequent versions of the product. Moving to version 1.7 should be a straightforward upgrade. Please work with your support contact who will assist as you upgrade, or reach out to support@portworx.com if you do not know your contact. For more on our release terminology, the schedule of the extended maintenance, and a draft of the release schedule, please see the diagram below. While the framework will not change, calendar dates are subject to change. 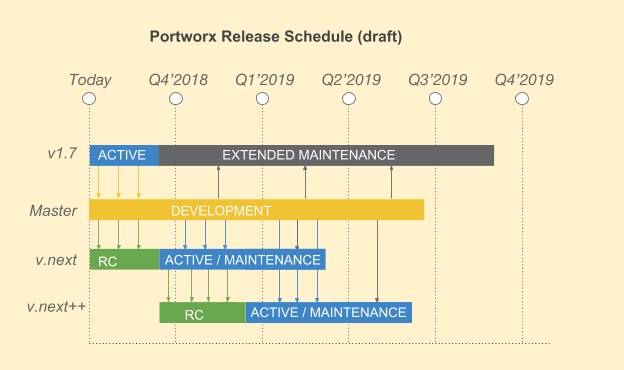 Extended maintenance: Portworx will continue to support version 1.7, including with support tickets and security fixes. Release Candidates: before a product is declared Generally Available (GA) and should be used only in pre-production. Active: once a product has been declared Generally Available. The product is ready for production. The product will continue to get a minor wave of functionality enhancement. Maintenance: overlaps with Active phase of release to provide six months of support from the GA date. The release continues to be supported and receives critical fixes. We want to work with our customers to make sure we have accounted for every contingency. Please reach out to us if you have any concerns.